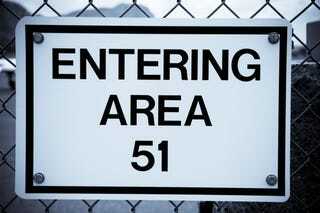 Despite the CIA's release of previously classified documents in 2013 that acknowledged the existence of Area 51 as a top-secret U.S. government research facility, many questions about the site remain unanswered. One of the most innocuous, but nonetheless puzzling, is its choice of name. Although theories abound, one plausible explanation is that the moniker derives from its designation as a nuclear weapons testing site. Situated in the desert in southern Nevada, within the boundaries of the Nellis Air Force Range (NAFR) and just outside of the northeast corner of the Nevada Test Site (NTS), Area 51 and its neighbors, which also includes the Tonopah Test Range (TTR), have hosted some of the most significant weapons testing performed on the planet during the 20th century. In addition to isolation, the 3.5 million acre region around and including Area 51 boasts other qualities that make it an excellent place to conduct secret tests and training. The dry climate provides superior flying conditions, the variety of terrain helps with gunnery practice, and several dry lake beds are available for emergency landings, including, notably, Groom Lake – situated just north of Area 51. Therefore, beginning in 1940, public land in the region was set aside and private land was condemned in order to establish the Las Vegas Bombing and Gunnery Range (LVBGR) (today, the NAFR and TTR), which was used throughout World War II "as an aerial gunnery range for Army Air Corps pilots." As the Cold War began, there was a perceived need for the development and testing of nuclear weapons, and the barren and relatively uninhabited region surrounding Area 51 was identified as an ideal location; as such, a large swath of the southern portion of the LVBGR was set aside as the aforementioned NTS, for testing a variety of nuclear items. Despite the fact that Las Vegas is only 65 miles from its southeast edge, those involved in the site choice minimized any potential danger to the population, with Enrico Fermi opining "that people will receive perhaps a little more [ionizing] radiation than medical authorities say is absolutely safe." In any event, nuclear testing began at the NTS in its southeastern corner at a place known as Frenchman Flat (FF) on January 27, 1951. After the four remaining devices of the Ranger series were detonated (and studied), also at FF, the locations of nearly all further testing (with a handful of notable exceptions) at NTS were thereafter identified by their "area" numbers, beginning with the Buster-Jangle series in October-November 1951 in Area 7. This was to ensure that it "allowed anyone 'in the know' to know where a test would be conducted . . . [and] the same system is still used today." According to an official NTS guide, the test areas were assigned unique numbers as they were designated, and, as can be seen from amap of the NTS, early on the "area assignments were randomly made (to avoid a set pattern)." Nonetheless, the Atomic Energy Commission (AEC) personnel who assigned the test areas took a rational approach and began with, essentially, numbers 1-30. Note that not every numeral between 1 and 30 appears on the NTS map. Notably missing are 13, 21, 24 and 28; nonetheless, these numbers were apparently used to designate areas for atomic testing in the region – albeit outside of the set-aside NTS zone. For example, an "Area 13″ was designated just northeast of the NTS in the NAFR, while "Area 24″ refers to the North Las Vegas Facility, a satellite site of the NTS managed by the National Nuclear Security Administration's Nevada Site Office (NNSA). "Area 28″ was originally designated in the southwestern part of the NTS in the vicinity of areas 25 and 27, into which it was absorbed. "Area 21″ is less easy to identify. Although there is a "Technical Area 21″ at Los Alamos National Laboratory (LANL) in north-central New Mexico. However, as that site has its own extensive numbering system, it is doubtful it is the missing NTS area. Regardless, although the LANL areas may be unrelated, it is clear that NTS-related nuclear testing was done outside of its territorial boundaries, but included within its numbering system. For example, in "Area 13," an experiment called Project 57, was run on April 24, 1957, to explore whether or not the explosive charge of a nuclear warhead could self-destruct the weapon without causing an atomic explosion. Likewise, four other extra-territorial experiments (Double Tracks and Clean Slate I, II and III) to observe "(nonnuclear) detonation of nuclear weapons" were performed on the TTR, at a site designated as "Area 52," in May and June 1963. Similarly, at "Area 58″ on October 26, 1963, near Fallon, Nevada (well outside of the NTS), the Shoal experiment involved the detonation of a 12-kiloton bomb 1,200 feet below the Earth's surface, just to observe earthquake effects. While not conclusive, the fact that "areas" were designated well-into the 50s supports the inference that "Area 51″ was a part of that pattern. Also compelling is the fact that Tonopah's "Area 52″ is likely just as close to, yet also just outside of, the NTS. And while it should come as no surprise that there are no direct records of nuclear testing activities at the secretive Area 51, there is a notable entry on the National Resource Defense Council's (NRDC) comprehensive list of nuclear tests (1945-1992), that may be relevant. Note that this list provides the name of every "event" (e.g., Trinity, Fat Man or Shoal), as well as its date, location (usually detailed, such as "Alamogordo, NM" or "NTS (Area 3)"), the lab that ran the test (e.g., "LA" for Los Alamos), the device type (such as whether it was dropped from a tower or plane, or down a shaft), the height and depth of the burst, and its purpose (e.g., "WR" for "weapons related'). Regarding the NTS-related tests, other than the Frenchman Flat (FF) experiments, only six were not identified on the list by an area number: the four performed at Area 52, which were designated "Bombing Range, NV," the Shoal at Area 58, which was designated "Fallon, NV," and a third, run on May 10, 1962. This last was a shaft test performed on a weapons related device, attributed to the NTS, but with no "area" or other location designated; in addition, neither the lab that ran the test, nor the height or depth of the burst are recorded, and instead question marks ("?") are inserted under those categories on the list. Obviously this isn't conclusive, and the name of the event is consistent with contemporaneous tests conducted by the Lawrence Livermore National Laboratory (LLNL), but it is curious. And, when combined with Area 51's proximity to the NTS, the site's history of extreme secrecy, its consecutive numbering with neighboring test areas, and the fact that the experiment was conducted in the region one year prior to those performed at Area 52, together these factors present a circumstantial case that Area 51 was designated as part of the NTS numbering system. This post has been republished with permission from TodayIFoundOut.com. Image by Shutterstock/Alexey Stiop.